Pure devotees have no objective in life other than to fulfill the desires of the Supreme Lord. They are thus ready to do anything if it pleases the Lord. None of their activities has the slightest hint of material desire in it. Srinivas Acharya is the śakti-āveśa avatāra of Mahaprabhu and only a person who has received his special blessings can describe his transcendental activities. Gangadhara was overcome with grief when Mahāprabhu took sannyas in Katwa, and he began to cry constantly while calling out the names “Ha Chaitanya! Ha Chaitanya!” When the other devotees saw him intoxicated in divine love for Mahāprabhu, they nicknamed him Chaitanya Das, a name that stuck with him for the rest of his life. Chaitanya Das was indifferent to the things of this world, but one day he suddenly felt a strong wish to have a son and told this to his wife, Lakshmi Priyā. She responded by telling him to go immediately to Puri to submit to Mahāprabhu. The couple left for Puri, first stopping for a few days in Jajigram at the house of Lakshmi Priya’s father, Balaram Vipra. Once they had received Mahāprabhu’s blessing, Chaitanya Das and his wife returned to his home and when the auspicious moment came, a son was born to them. Chaitanya Das immediately consecrated the child to Mahāprabhu. The baby went through the early childhood rituals of the first feeding of solid food, name-giving, tonsure, and sacred thread ceremony. The associates of Mahāprabhu, such as Govinda Ghosh and the residents of Srikhanda Narahari and Raghunandan, poured affectionate blessings on the child. Srinivas Acharya was devoted to his parents. He was fortunate to hear about Mahāprabhu’s divine glories as well as Radha and Kṛṣṇa’s Vrindavan pastimes from Chaitanya Das. Father and son would go into an ecstatic state as they discussed these transcendental topics. His mother trained him in various forms of Nama-sankirtan. He studied grammar, literature and poetic theory from Dhananjaya Vidya Vachaspati, and quickly acquired mastery of these subjects. Srinivas’ father left the world while he was still quite young. The loss of his father’s association greatly affected Srinivas, but the other devotees made a concerted effort to console him and his mother in their grief. Srinivas took his mother and moved from Chakhandi to his maternal grandfather’s house in Jajigram where the villagers were overjoyed to see him. Shortly after moving to Jajigram, he went to visit Narahari Sarkar in nearby Srikhanda. From Narahari Sarkar he learnt that Mahāprabhu would shortly be ending His earthly pastimes. This news made Srinivas determined to see the Lord before it happened. He quickly returned to Jajigram and took permission from his mother to make the trip to Puri. He then joined the devotees on the annual pilgrimage. It was the fifth day of the waxing moon. Before Srinivas arrived in Puri, however, the news that Mahāprabhu had indeed ended His lila reached the party of pilgrims. Srinivas Acharya fainted at hearing this report, and when he came back to consciousness, he decided to commit suicide. However, the Lord Himself appeared to him in a dream and told him to complete his journey to Puri. Once in Puri, he again had a dream in which he saw Jagannath, Baladev and Subhadra, as well as Chaitanya Mahāprabhu with His associates. In Puri, Srinivas met Śrīla Gadadhar Pandit Gosvāmī, the avatāra of Mahāprabhu’s pleasure potency, and both of them were immersed in an ocean of ecstasy. He also met Raya Ramananda, Paramananda Puri, Shikhi Mahiti, Sarvabhauma Pandit, Vakresvara Pandit, Govinda, Śhankar Pandit, and Gopinath Acharya and received blessings from them all. Srinivas stayed in Puri for some time, hearing Srimad Bhagavatam from Gadadhar Pandit Gosvāmī and was enchanted. Gadadhar then told him to return to Gauda. While on his way to Bengal, Srinivas learnt that Advaita Acharya and Nityananda Prabhu had also wound up their earthly pastimes. Once again he determined to end his life in Their separation, but the two Prabhus appeared to him in a dream to assuage his grief and persuaded him to give up his resolve. When he arrived in Nabadvīpa, Srinivas was once again plunged into an ocean of despondency at the loss of Chaitanya Mahāprabhu. Vamsivadananda Ṭhākura saw him in this condition and approached Viṣṇupriyā Devi and asked her to grant Srinivas an audience and to bless him. Srinivas Acharya was amazed to see Srimati Viṣṇupriyā Devi’s deep faith towards Mahāprabhu’s worship with intense renunciation. 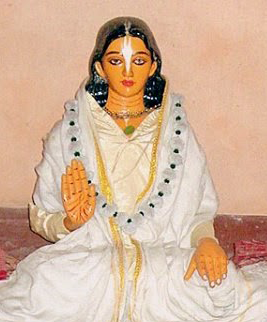 While in Nabadvīpa, he had a dream of Sachi Devi and received blessings from her, too. Srinivas then wandered throughout Bengal, going to all the Sripats of the associates of Mahāprabhu and Nityananda Prabhu, seeking their blessings. In this way, he visited Shantipur, Khardaha, Khanakul Krishnanagara, and Srikhanda. Among the parshads he met were Murari Gupta, Srivas Pandit, Damodar Pandit, Shuklambar Brahmachari, Gadadhar Das, Paramesvari Das, Jahnava Devi, Vasudha Devi, Virabhadra, Abhiram Ṭhākura, Narahari Sarkar Ṭhākura, and Raghunandan Ṭhākura. All these great personalities witnessed Srinivas’ intense devotion and told him to go to Vrindavan. Srinivas then went to his mother and repeatedly asked her for permission to make the trip. His mother could not refuse when she saw his eagerness. Srinivas then travelled through Agradwip, Katwa, Maureshwar, Ekachakra, then went to Kashi, Ayodhya, and Prayag. He spent a long time visiting all these holy places before he finally arrived in Vraja. There he learnt that Rupa Gosvāmī, Sanatan Gosvāmī, Kashisvara Pandit and Raghunath Bhatta Gosvāmī had all disappeared. Raghunath Das Gosvāmī, Gopal Bhatta Gosvāmī and Jiva Gosvāmī were still living, however. Srinivas met all three of them and received their blessings. He was initiated by Gopal Bhatta Gosvāmī and took instruction in the Vaiṣṇava scriptures from Jiva Gosvāmī. In great affection for Srinivas, Jiva Gosvāmī commended him to his deities, Radha Damodar. Srinivas met Raghunath Das Gosvāmī and Kṛṣṇa Das Kaviraj Gosvāmī in Radha Kund and received their blessings. One day Śrī Jiva Gosvāmī heard Srinivas explain a verse from Ujjvala-nīlamaṇi and was so impressed by his erudition that he bestowed the title “Acharya” upon him. Jiva Gosvāmī also gave the titles “Ṭhākura” to Narottam and “Shyamananda” to Duhkhi Kṛṣṇa Das. Jiva Gosvāmī ordered Srinivas Acharya Prabhu to tour all of Vraja’s pilgrimage sites with Raghava Gosvāmī. Śrī Jiva Gosvāmī and the other Vaiṣṇavas in Vraja ordered Srinivas Acharya, Narottam Ṭhākura and Shyamananda Prabhu to take manuscripts of the invaluable Gosvāmī’s literature placing them in a chest that was offered to them by a rich merchant in Mathura back to Bengal in an ox-cart. They set off on the Śuklā Pañcamī of Agrahayan month. It was a long and dangerous trip, but they were able to cover the greater part of the distance without any trouble. Upon arriving in the Hindu kingdom of Bana Viṣṇupura, they felt that the danger was over. However, the rumor had reached the capital of Viṣṇupura that a rich merchant was travelling to Puri with a valuable cargo of merchandise. Bir Hambir, the ruler of Bana Viṣṇupur, was also the leader of a gang of highwaymen. When he heard that a cargo of great value was passing through his territory, he asked an astrologer to confirm the truth of the rumors. The astrologer confirmed that the chest being carried on the oxcart was indeed of great value. The king immediately sent a group of robbers to steal the chest, thinking that it contained gold and jewels. He specified to the robbers that they should kill no one. The robbers first worshiped the goddess Chandi, then sent out a spy who returned to tell them that everyone in the group accompanying the oxcart was sleeping in exhaustion after eating their evening meal. The robbers felt that Chandi had mercifully given them a golden opportunity to make the raid. They stole the chest of books, and turned them over to the king of Viṣṇupur. The mere sight of the holy books had a purifying effect on the king, however, and he regretted having stolen them. Indeed, he desired to meet with the acharya who owned them. That night he had a dream in which this acharya appeared to him and this pacified him somewhat. The next morning, Srinivas Acharya, Narottam Ṭhākura and Shyamananda Prabhu awoke to find the chest of books missing. They searched everywhere, but when they failed to find any clue of the books’ whereabouts, they felt so depressed that they considered killing themselves. Some local villagers saw the distressed condition of the three Vaiṣṇavas and immediately suspected the robber king, Bir Hambir and rebuked him. Srinivas Acharya made some further inquiries and was assured that he would be able to find more information from the king himself. 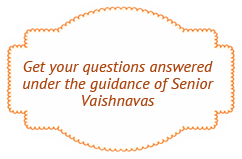 The three Vaiṣṇavas felt some hope and abandoned their suicidal intentions. Srinivas Acharya decided to remain in Viṣṇupura in the hope that he would be able to recover the manuscripts, but he sent Narottam Das Ṭhākura to Kheṭurī and Shyamananda Prabhu to Orissa. While staying in Viṣṇupura, Srinivas Acharya heard from a Brahmin named Krishnavallabha that Bir Hambir liked to listen to Srimad Bhagavatam and daily attended its recital. One day, Srinivas Acharya went with this Brahmin to the place where the Bhagavata was recited. The Brahmin introduced Srinivas Acharya to the king as a great Vaiṣṇava, and the king indeed observed the characteristics of a great person in him and was attracted to him. The King expressed a desire to hear Srinivas Acharya speak on the Bhagavata and Srinivas Acharya agreed, thinking that this might be a good opportunity to recover the books. So he started to speak on the Bhagavata on a daily basis. The King was enchanted by Srinivas Acharya’s unprecedented explanations of the Bhagavata in his sweet voice. Srinivas Acharya preached Mahāprabhu’s teachings both through speaking on the Bhagavata and kirtan, while Narottam Ṭhākura and Shyamananda Prabhu primarily used the medium of kirtan. Each of them had his own particular style of singing kirtan, by which they intoxicated their listeners with devotional ecstasy. The styles that these three acharyas used respectively were named manohara-sāhī, garāṇahāṭī, and reṇeṭī. Bir Hambir arranged for a secluded dwelling to be given to Srinivas Acharya. One day, when he had the opportunity to find the king alone in his apartments, Srinivas Acharya recounted the entire story of his journey from Vraja and the theft of the manuscripts. The King immediately confessed, showing great sorrow for his misdeed, and had the chest of books returned to him. Greatly relieved, Srinivas Acharya immediately sent messengers to Vrindavan, Narottam Ṭhākura and Shyamananda Prabhu with the good news. In the course of time, Bir Hambir and his entire entourage all took initiation from Srinivas Acharya and dedicated their entire lives and wealth to him. At initiation, Bir Hambir was given the name Chaitanya Das. After staying in Bana Viṣṇupura for some time, Srinivas Acharya returned to his maternal grandfather’s house in Jajigram. Then he set off on another tour of Katwa, Nabadvīpa and other towns in Bengal. Srinivas Acharya respected Narahari Sarkar of Srikhanda greatly and was also very devoted to his saintly mother. When Narahari Sarkar heard Srinivas Acharya’s mother express her desire to see her son married, he gave him the order to do so. Even prior to receiving this order, Srinivas Acharya had received the same command from Advaita Acharya in a dream. Though he felt somewhat ashamed, he realized that he could not ignore the wishes of Advaita Prabhu, Narahari Sarkar and his mother. He thus agreed to get married and was wed to Ishwari, the devoted daughter of Gopal Chakravarti of Jajigram. It is not always easy to understand the divine activities of Mahāprabhu’s devotees. Only someone who is totally surrendered to the Lord and His devotees can comprehend their glories. “O my master, Srinivas Acharya! Please be merciful to me. I, Narottam Das beg you to give me the association of Ramachandra. When Shuklambar Brahmachari, Gadadhar Das, Narahari Sarkar and Dvija Hari Das Acharya all ended their earthly activities, Srinivas Acharya once again overcome by grief and made another trip to Vrindavan. Ramachandra Kaviraj and Shyamananda Prabhu also joined Srinivas Acharya in Vraja on this occasion. Srinivas Acharya met with Gopal Bhatta Gosvāmī and Śrī Jiva Gosvāmī, as well as with Bhugarbha Gosvāmī and Lokanath Gosvāmī, and these great devotees encouraged him and diminished his feelings of loss. When he returned to Gauda, Srinivas Acharya joined in the festivities occasioning the the departure of Gadadhar Das in Katwa, Narahari Sarkar in Srikhand and Dvija Hari Das Acharya in Kanchan Gariya. From there he went to Budhari village, where Ramachandra Kaviraj and Govinda Kaviraj hosted him in great opulence. Narottam Das Ṭhākura had also left Vrindavan on Lokanātha Gosvāmī’s orders, returning to Kheturī. On the full moon day of Phalguna, he established the worship of six sets of deities in the temple there: Śrī Gauranga, Śrī Vallabhi Kanta, Śrī Vraja Mohan, Śrī Kṛṣṇa, Śrī Radha Kanta, and Śrī Radha Raman. Srinivas Acharya performed the installation ceremony and the first puja. Jahnava Devi was also present at this great event. After the festival, she went on to Vraja with her entourage. Upon her return, she met with Srinivas Acharya at Katwa and then went with him to Jajigram where she spend some time as his guest. Srinivas Acharya made another trip to Nabadvīpa with Narottam Ṭhākura and Ramachandra Kaviraj, performing the parikramā of the nine islands, each of which represents one of the limbs of devotional service. When Raghunandan Ṭhākura entered the nitya-līlā, Srinivas Acharya went to Srikhanda and participated in the disappearance festival. He returned with a heavy heart to Jajigram, and from there went to Bana Viṣṇupura. The King and the other residents of the town were excited by his visit and received him with great pomp. In Viṣṇupur, Srinivas Acharya received an order from Mahāprabhu in a dream to accept the hand of Gauranga Priya, the daughter of a certain Raghava Chakravarti. Raghava Chakravarti and his wife Mādhavi had been searching for a suitable husband for their daughter. They had simultaneously received the order to give their daughter in marriage to Srinivas Acharya in a dream. Srinivas Acharya thus married for a second time.